A lot of the time my kids are like, "Mom, why do we always eat the same exact junk for lunch everyday?" And most of the time I just say, "Eat it or starve, it's up to you," but sometimes (rarely) I'm just awesome and instead of giving them different junk, I just make it LOOK different. Grab a piece of bread, and some cheese, and some raisins, and a couple crackers and a carrot stick. Place orange-y cheese on the bread. Then take some string cheese and separate it into strips. 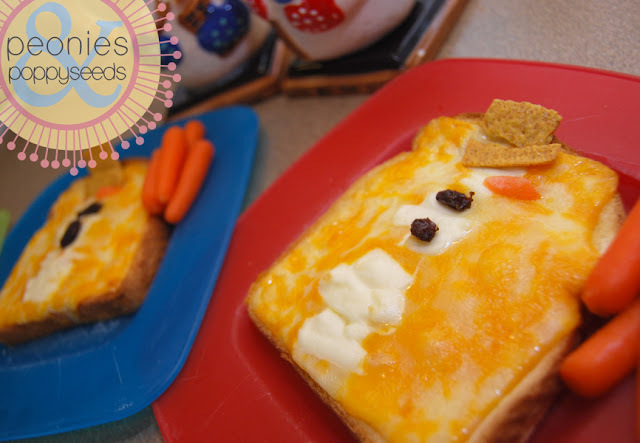 You'll need to place those strips in the middle of the bread in a snowman formation (head, middle, body). Don't worry about making perfect circles, because I doubt your kids will care. Melt the cheese by placing the bread on a cookie sheet in a hot oven (or a toaster oven). Place a couple of raisins on the middle of your snowman for buttons. Break your crackers so that you have a "brim" and a hat. (I used wheat thins.) And put it on your snowman's head. 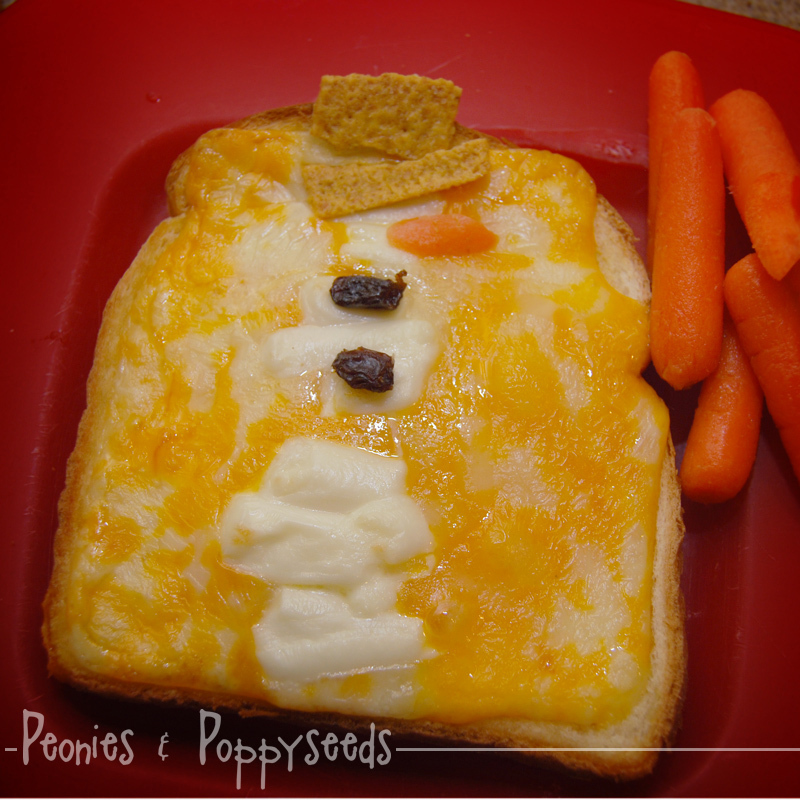 With a small knife or a grater or peeler, make a tiny nose out of a carrot and set it on the snowman's face. 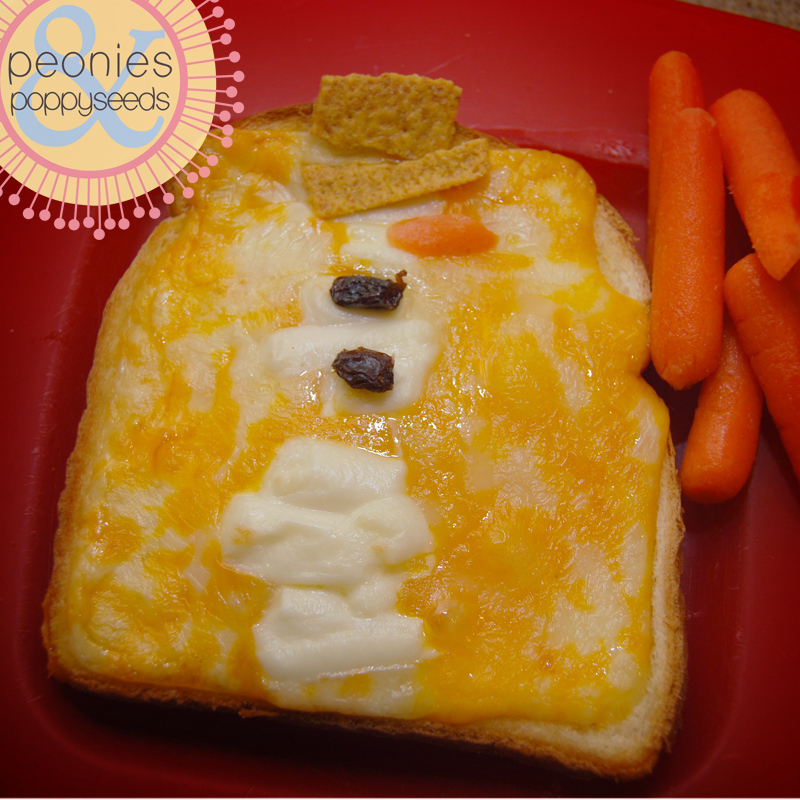 I served this with carrots, because they seemed snowman-y. Also I made hot chocolate because, like I said, I was being awesome that day. Want to know when we post new recipes?